SUPER BOWL LIII: After a long and winding regular season and a controversial Championship Sunday, we’ve finally reached the end of the road– the Super Bowl, a sporting event and entertainment spectacle all wrapped up into one, and an opportunity for those involved to achieve football immortality. Of course, one of the teams that will take the field on Sunday is chock full of players and coaches who have already achieved that immortality many times over– regardless of what happens in this game, we’ll all remember this New England Patriots dynasty 40 years from now, and two things have been a constant throughout: Tom Brady and Bill Belichick. Brady is still at the top of his game at age 41 and should be able to do some damage against this L.A. defense if he can avoid Aaron Donald and the rest of the Rams pass-rushers, while Belichick, though perhaps not quite as involved in the defensive gameplan as he was early in his career, will no doubt have something unexpected up his sleeve for Sean McVay and the explosive Rams offense. McVay has been the talk of the NFL for the past two seasons, as many of the new head coaching hires in this recent cycle were obviously influenced by him and the success he’s having– everybody wants the next Sean McVay. The Rams needed a miracle of sorts, delivered by the guys in stripes, to get by New Orleans in the NFC Championship game, but nobody will care about that come gametime, and you know that facing the Patriots in the Super Bowl is a football dream come true for everybody in that locker room. They’ll be ready. Throughout most of the season, the Rams boasted the NFL’s most feared offense this side of Kansas City. They finished the year ranked second in the league in both total yards and points scored, averaging an eye-popping 32.9 points per game. They can hurt you in a multitude of ways: running back Todd Gurley was the NFL’s Offensive Player of the Year in 2017 and led the league with 21 touchdowns this season, to go along with 1,251 rushing yards in 14 regular-season games. Gurley missed the final two games of the season with knee soreness and has split the workload with C.J. Anderson ever since, but Anderson has been effective as well, and L.A. leads all teams in rushing this postseason, racking up 350 combined ground yards in wins over Dallas and New Orleans. The running game may soften defenses up, but it’s a diversified passing attack that really sets the L.A. offense apart. Sean McVay has found a willing pupil in Jared Goff, and together they torched the league in 2018, as Goff ranked fourth in the NFL in both passing yards (293 ypg) and yards per attempt (8.36 ypa). With receivers like Brandin Cooks and Robert Woods at his disposal, Goff is surrounded by plenty of weaponry, and the Rams probably have the edge at receiver in this game, but it should be mentioned that the L.A. passing attack hasn’t quite been the same since slot man Cooper Kupp went down with a season-ending injury in Week 10. For that matter, the L.A. offense as a whole, though still effective these past few weeks, simply hasn’t been the unstoppable machine that it was throughout the first half of the season. They’ve only topped 30 points twice in their past 7 games after doing so in 9 of their first 11 contests, and their numbers have declined across the board. The steepest drop-off has come from Goff himself: after looking like an MVP candidate over the first 12 weeks of the season, Goff has come crashing back to earth, totaling 216 passing yards or fewer in 5 of his past 7 outings, with a 7/6 TD-to-INT ratio in that span. Undoubtedly the absence of Kupp and the injury to Gurley have played a role, but regardless of the “why”, it’s clear that Goff’s play tailed off a bit down the stretch. The New England defense, meanwhile, played perhaps its best two games of the season in the team’s two playoff games, a testament to the greatness of Belichick and the defensive coaching staff. In the AFC Championship Game, the Pats held the top-ranked Kansas City offense to a season-low 290 total yards and seemed to genuinely frustrate Patrick Mahomes at times. Now, that’s not to say that New England has the edge here— the Pats ranked 21st in total defense this season, so they’re far from dominant on that side of the ball, and the Rams are just two games removed from hanging 459 yards on an excellent Dallas defense. The New England defense is the underdog in this matchup, but considering what we’ve seen out of both teams lately, I give them a fighting chance of slowing down the L.A. juggernaut. Despite steady whispers of Brady’s decline, the New England offense hummed along nicely this season, ranking 5th in the NFL in total offense and 4th in points scored, averaging 27.3 ppg. They were effective and efficient, but not necessarily explosive, and were consistently overshadowed and outshined by high-scoring units in Kansas City, New Orleans, and, yes, Los Angeles. Since the playoffs began, however, Brady & Co. have been nearly unstoppable, putting up 78 combined points and over 1,000 combined yards of offense in wins over the Chiefs and Chargers. Brady himself was brilliant in the two games, completing over 71% of his passes for 691 yards and directing the offense on 10 touchdown drives. As good as Brady is, however, the thing that makes the Patriots offense so dangerous is their versatility. Josh McDaniels is a gifted play-caller, maybe the best in the league when it comes to figuring out ways to attack an opposing defense. The Pats can run the ball effectively and beat you with the short passing game, but they can also hurt you downfield despite a dearth of playmaking wideouts, as Brady ranked 8th in the NFL in passer rating on throws that traveled at least 15 yards in the air this season. In the playoffs, he’s 6/11 for 156 yards on such throws. It truly is a “pick your poison” situation with this New England offense. One way the Patriots will surely look to attack the Rams defense is with the play-action passing game. The L.A. D really struggled with play-action this season, ranking last in the NFL in passer rating allowed against play-action dropbacks, and the Pats sure aren’t shy about using play-action, as they ranked third in the league in such attempts this season. One thing play-action does is slow down the pass rush, and that will be an absolute must if the Patriots hope to win this game— the formula for beating New England these past few years has nearly always involved pressuring Brady, and with All-Pro defensive tackle Aaron Donald and some quality edge rushers, the Rams are certainly capable in this area. But the New England o-line has been tremendous and McDaniels can help them out schematically, so getting to Brady will not be easy. And it’s not like the L.A. pass rushers can just pin their ears back and forget about the running game— the Pats ranked 5th in the league in rushing this season and are averaging 165.5 rushing yards per game in these playoffs, while the Rams allowed a staggering 5.1 yards per rush in 2018, the worst mark in the league. 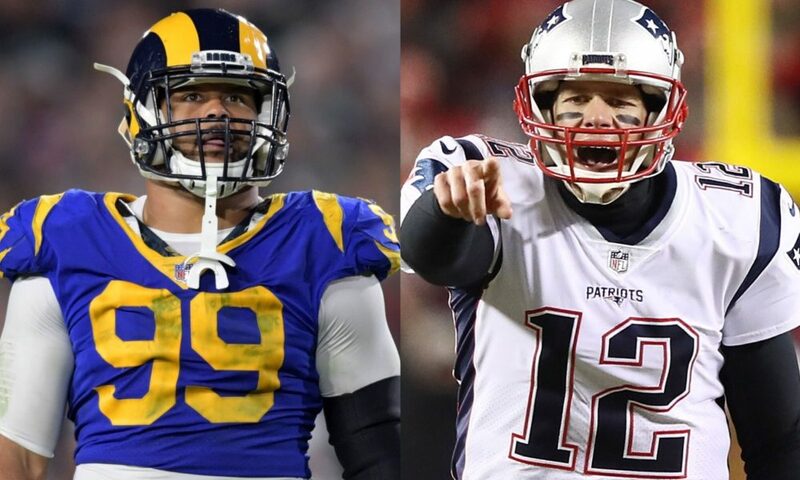 Bottom line: the Rams are going to have their hands full with this New England offense, and if they can’t pressure Brady, they’re in big, big trouble. When the Belichick/Brady Patriots have lost big games, it’s usually been because opposing teams have been able to consistently pressure Brady, disrupting the timing of the New England offense. And while the Rams have the front seven personnel to do so, the Patriots o-line has done such a remarkable job in protection this season, especially lately, that’s it’s difficult to imagine a scenario in which Brady is harassed and harangued like he was in, say, the Super Bowl losses to the Giants. And if Brady is given time, he should be able to pick apart a Rams defense that was exposed several times this season.